Today’s youth are the cornerstone of tomorrow’s society. How well-equipped they are with education, skills and professional experience will determine their success and our future. 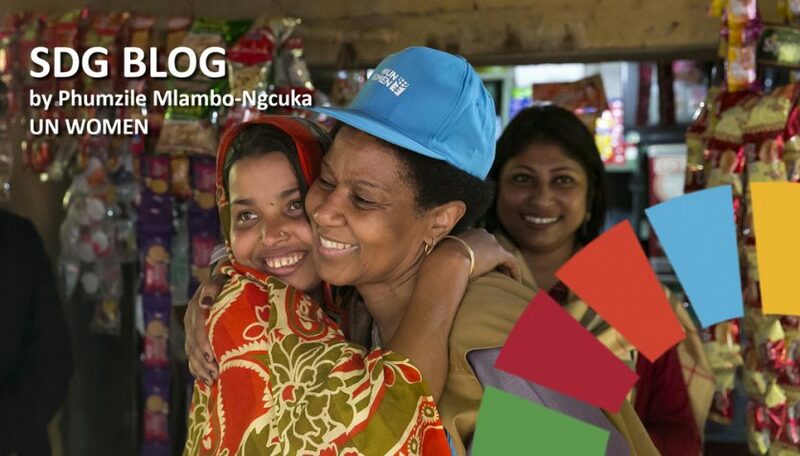 The Economic and Social Council (ECOSOC) Youth Forum, will take place on 8-9 April 2019, providing a platform for young leaders from around the world to engage in a dialogue among themselves and with United Nations Member States and to share ideas for advancing the 2030 Agenda for Sustainable Development, the Addis Ababa Action Agenda on financing for sustainable development, and the Paris Climate Agreement. The Forum serves as a unique space for young people to share their vision and elaborate their substantive contributions to United Nations upcoming meetings. This month also sees the 2019 ECOSOC Forum on Financing for Development follow-up, to be held 15-18 April at UN Headquarters in New York. Among the important issues to be discussed by the Forum is finding the appropriate policy mix to make growth more inclusive and generate decent work opportunities for all. UN DESA’s latest Monthly Briefing on the World Economic Situation and Prospects reviews global labour markets, with a focus on youth. Youth employment remains a global policy challenge. Since the global economic crisis in 2009, the number of young persons (aged 15-24) in employment has contracted by more than 15 per cent. While this partly reflects extended education, globally, 21.2 per cent of young people were in neither employment, education nor training last year. 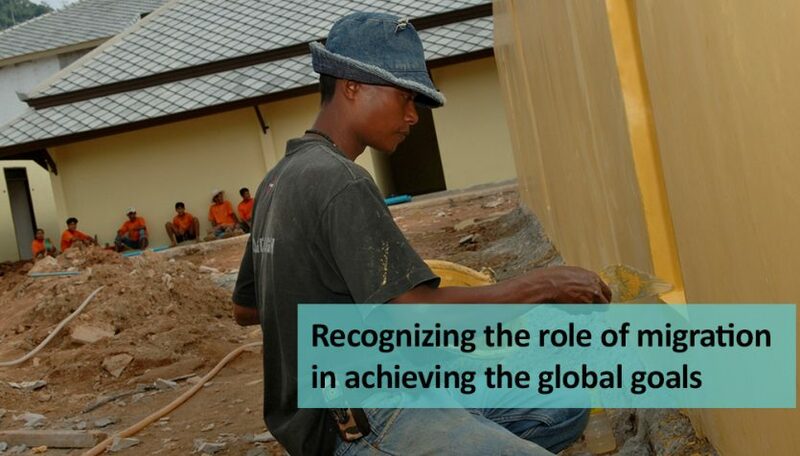 According to ILO’s “World Employment and Social Outlook: Trends 2019”, this has long-term implications for income prospects of individuals, and over time, a high share of young people who are neither acquiring skills through education or employment acts as an obstacle to innovation and sustained economic growth. While youth unemployment is a global problem, the challenge in Africa is particularly daunting. Africa has the youngest population in the world. Countries such as Niger, Uganda, Angola and Mozambique have a median age for their population of below 18 years, and the reduction in infant mortality coupled with slowing but still high fertility rates has translated into a significant “youth bulge” across the continent. It is estimated that about 10-12 million people in the continent are joining the labour force each year, a figure projected to rise further in the next decade. This potentially entails enormous economic benefits. Yet, translating this “youth bulge” into a “demographic dividend” critically depends on the capacity to generate productive jobs. Future labour market situations hinge on initial experiences, including the ability to access the labour market, and on the skills and competencies acquired and continually updated through life-long education and training. A cohort of youth excluded from the labour market can negatively impact many spheres of society, making strategies for youth employment a central piece of sustainable development. Promoting youth capacity building and labour force participation with decent jobs, as well as swift school-to-work transitions remain crucial. Globally, labour productivity has been on the up and unemployment has decreased. However, we need to make more progress to increase employment opportunities, especially for young people. 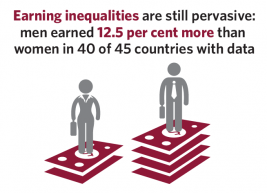 Informal employment and labour market inequality must be reduced, particularly the gender pay gap. To ensure sustained and inclusive economic growth, we also need to promote safe and secure working environments and improve access to financial services. 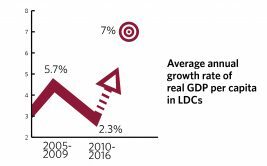 For least developed countries, the real gross domestics product (GDP) per capita fell sharply from 5.7 per cent in 2005–2009 to 2.3 per cent in 2010–2016. 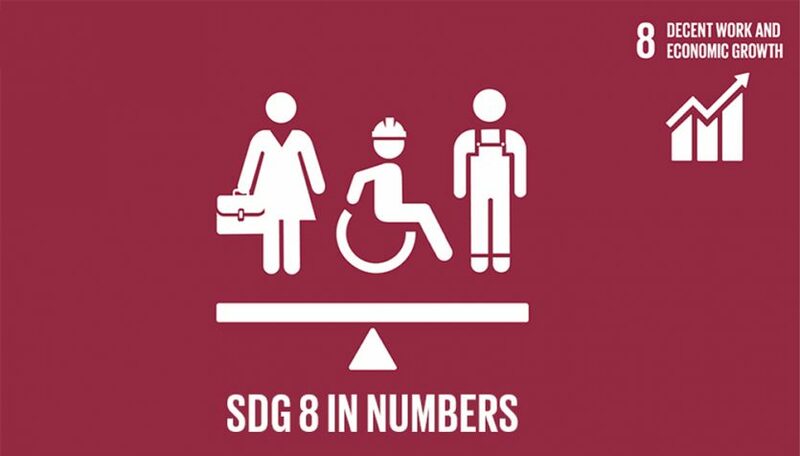 That is only one third of the SDG 8 target of 7 per cent annual growth. Labour productivity measures how much economic output an average employee produces. At the global level, productivity grew by 2.1 per cent in 2017. This is the fastest growth registered since 2010. Globally, 61 per cent or nearly two in every three workers were engaged in informal employment in 2016. Excluding the agricultural sector, 51 per cent of all workers fell into this employment category. Data from 45 countries suggest that women still earn less than men: in 89 per cent of these countries, the hourly wages of men are, on average, 12.5 per cent higher than those of women. The global unemployment rate in 2017 was 5.6 per cent, down from 6.4 per cent in 2000. Youth are three times more likely to be unemployed than adults, with the global youth unemployment rate at 13 per cent in 2017. Worldwide, 152 million children between 5 and 17 years are victims of child labour; almost half of them (73 million) work in hazardous child labour. 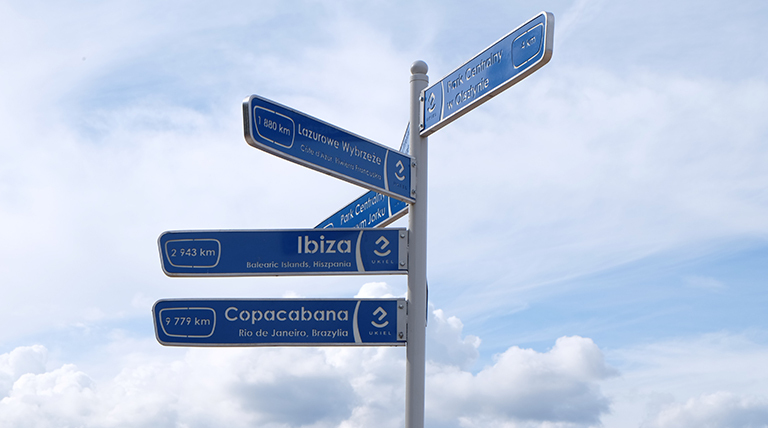 Standardization of geographical names – why does it matter? In today’s digital world, standardized geographical names are vital. They help us find our way in society and they also help us organize the world we live in. They also play a key role in our efforts to achieve sustainable development, providing fundamental channels of communication, facilitating cooperation among local, national and international organizations. We also need standardized geographical names in emergency situations. Without them, it can be challenging to respond to crises. This month, the “new” United Nations Group of Experts on Geographical Names (UNGEGN) will convene for its 2019 Session from 29 April to 3 May 2019 at UN Headquarters in New York. The session, organized by UN DESA’s Statistics Division, brings together over 150 experts from national naming authorities and academia to discuss strategies and methodologies by which the standardization of geographical names throughout the world can be advanced for the benefit of all citizens, Governments and non-governmental organizations. The Session aims to increase awareness of geographical names standardization, share the benefits that names provide to the daily functions in national economies and highlight its role as an enabler in preserving cultural heritage. It is hoped that delegates will be further empowered to strengthen their efforts to collect, manage and disseminate geographical names and forge partnerships and alliances to advance geographical names standardization. The Group of Experts has had a robust work programme spanning over 50 years, 30 sessions and 11 conferences and many significant milestones. In November 2017, the group was dismantled and recreated with the same name and new working methods. The 2019 session therefore heralds the first session of the new body, with a new agenda and over 90 papers for information and discussion, covering topics such as toponymic training, place names supporting sustainable development, toponymic data files and gazetteers, romanization systems, exonyms, geographical names as cultural heritage, and toponymic guidelines for map and other editors for international use. In keeping with its new standing the group will be formally launching its new website and a prototype of the world geographical names database web GIS application. The week’s activities include, special presentations, side events featuring working group and divisional meetings, an orientation session for new attendees and special workshops on “Linked Data Developments” and “The Unanswered Questions Relation to Indigenous Toponymy”. The meetings will be streamed live via UN Web TV. If you wonder why gender equality is so important, just try to think of any part of the world, or even any business, where it’s possible to say that we’ve already achieved it. Whether you consider equal pay for women when they do the same job as a man; a balanced group of decision makers bringing their experience to bear on an issue in boardrooms or parliaments; or women’s full engagement in peace processes; in every case there are gaps that are holding us back from achieving the 2030 Agenda vision of an end to poverty and a peaceful, sustainable world. Those gaps are the spaces where women – and girls – are missing. These days we’re also seeing mass gatherings of women and girls mobilizing to make their voices heard, in the global marches and online movements such as #MeToo, TimesUp, NiUnaMenos and #TotalShutdown that continue to grow around the world. Most recently, striking schoolchildren in several countries across Europe and elsewhere have been calling out for climate justice and action by policy makers. Their vibrant impatience is the hallmark of new generations of young activists whose engagement is a critical part of the road to 2030. They are right to be impatient: progress has been made but it’s still too slow. Despite advances in girls’ enrolment in primary education, 15 million girls of primary-school age are not getting the chance to learn to read or write compared to about 10 million boys. Every year, 12 million girls marry before the age of 18. Violence against women and girls remains a global pandemic, with one in three women and girls experiencing physical and/or sexual violence in their lifetimes. Today, women hold 24 per cent of parliamentary seats globally – still only half way to parity – and the global gender pay gap stands at 23 per cent. A good education can boost quality of life and open doors to decent work opportunities. It can give women and girls the life skills they need in order to know and claim their rights, to stand up against discrimination and violence, to become fully engaged citizens and to make decisions about their health care, including their sexual and reproductive health. It also benefits children, families and societies more broadly through poverty reduction and enhanced economic growth. We need men and women working side by side to dismantle the barriers to gender equality. One of the biggest problems is the unequal division of household work to care for the home and family members. Women spend on average 18 per cent of their day on this unpaid work, versus 7 per cent for men. In some countries that gap is much wider. Whether it is a young girl who is pulled out of school to fetch water or a woman who works full-time and then comes home to a “second shift”, when men step up and do their fair share, women are enabled to pursue paid employment, leadership and leisure activities. Governments and private sector leaders can play a critical role in making these choices easier, by implementing policies that support paid parental leave, affordable child care and flexible work arrangements. We can also do a great deal to change mindsets through working with partners on changing the stereotypes of men and women that appear in advertising, marketing and many forms of media and entertainment. Something as simple as changing the numbers of women who are depicted in advertising as professionals, rather than only as carers, can make an important contribution to changing what we regard as normal – and to shape a more ambitious future. Sport can also be one of the great drivers of gender equality by teaching women and girls the values of teamwork, self-reliance and resilience. It can provide girls with social connections and a refuge from violence in their homes and communities, and help them to understand their bodies and build confidence and the ability to speak up. This is particularly important during adolescence, when many girls abandon sport, whether under pressure to conform to traditionally “feminine” stereotypes, or because of early motherhood faced by young women like Dayane Santos in Brazil, whose life was turned around by the ‘One Win Leads to Another’ programme. Similar pressures to conform to pre-set educational stereotypes can stifle girls’ engagement in the learning they need to equip them for the future. We need to ensure that women and girls are learning the right skills for the changing world of work. Rapid technological and digital advances, including automation, robotics and artificial intelligence are leading to a loss of jobs, and raising the potential for heightened inequality, especially gender inequality. Collaborative initiatives like the African Girls Can CODE programme are combatting this challenges and building equality, through equipping participants like 15-year-old Eno Ekanem, from Abuja, Nigeria with the digital literacy and personal development skills they need to pursue education and careers in ICT and coding. The 2030 Agenda for Sustainable Development envisages for us a world where no one is left behind, where every woman, man, girl and boy is able to live up to their full potential. Eno and Dayane show us just how important equality is to bringing lasting change, and how those changes go hand in hand with improvements for us all. Despite the progress of recent decades, billions of people are still living without safe water – their households, schools, workplaces, farms and factories struggling to survive and thrive. Just four years into the 2030 Agenda, the world is already off-track to meet SDG 6: to ensure water and sanitation for all by 2030. 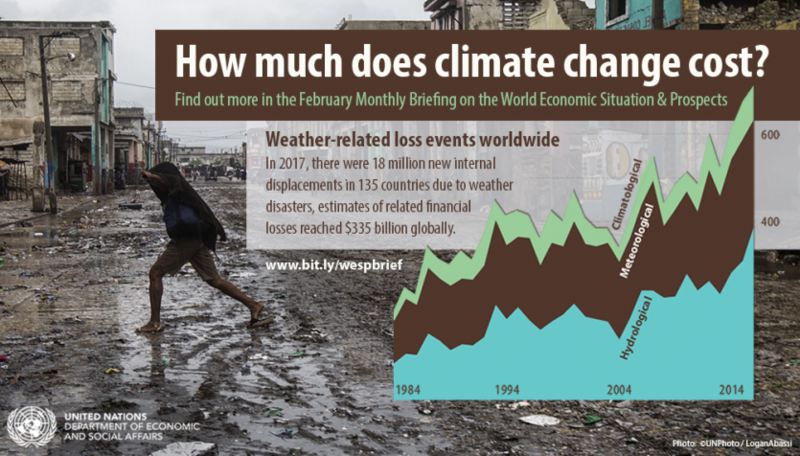 Demand is rising, pollution is worsening, funding is lacking and governance is often weak. Already-marginalized groups are being disproportionately affected by this water crisis. Women, children, refugees, indigenous peoples, disabled people and many others are often overlooked, and sometimes face discrimination, as they try to access and manage the safe water they need. 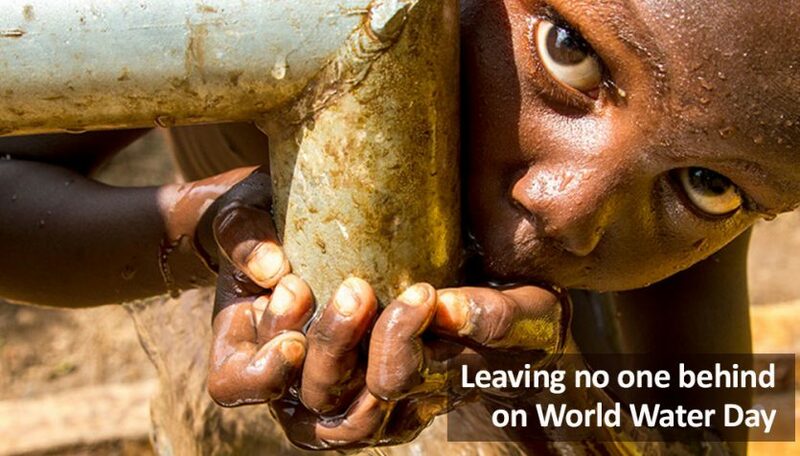 ‘Leaving no one behind’ is the theme of World Water Day on 22 March 2019 and the United Nations World Water Development Report launched on 19 March. The campaign and report shine a light on the grounds for discrimination that deny so many people access to safe water and sanitation, such as gender, ethnicity, religion, disability, age, and economic and social status. To ‘leave no one behind’, water services must meet the needs of marginalized groups and their voices must be heard in decision-making processes. Regulatory and legal frameworks must recognise the right to water for all people, and sufficient funding must be fairly and effectively targeted at those who need it most. These are all critical action points in the UN’s Water Action Decade, which continues until March 2028. ‘Water for all’ is not only the right thing to do, it is essential to achieving the 2030 Agenda. We have to act urgently, leaving no one behind. 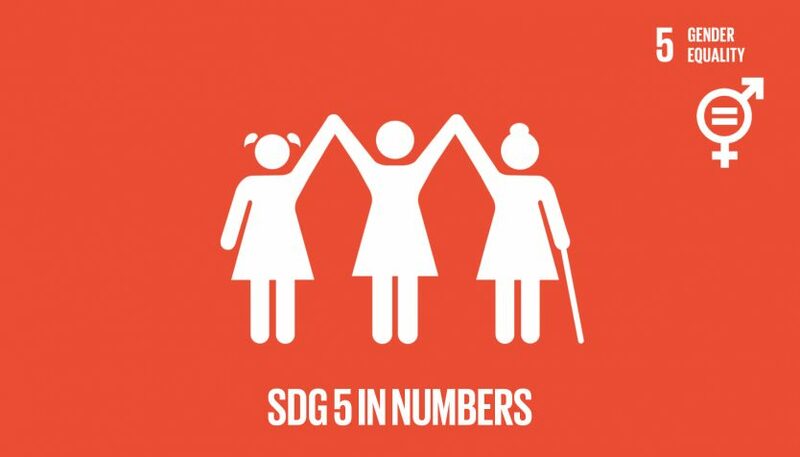 Gender equality and women’s empowerment is the key to achieving all the Sustainable Development Goals. Despite progress, gender inequality continues to hold women and girls back and deprive them of basic rights and opportunities. The practice of child marriage has been declining in the last decade, with the proportion of women who were married in childhood decreasing from one in four to approximately one in five. Child marriage is a violation of human rights that often leads to a lifetime of disadvantage and deprivation, especially for girls. One in five girls and women (aged 15 to 49) who have ever been married or in union experience physical and/or sexual violence by an intimate partner in the last 12 months, based on data from 87 countries. 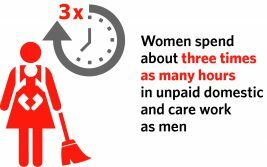 On average, women spend approximately three times as many hours in unpaid domestic and care work as men, and significantly more if they have children. Around 2017, one in three girls aged 15 to 19 had been subjected to female genital mutilation (FGM) in the 30 countries where the practice is concentrated, down from one in two around the year 2000. Some countries are making rapid progress. FGM is a human right violation affecting girls and women worldwide. It may lead to severe pain, excessive breathing, infections (including HIV), infertility, complications during childbirth and even death. Globally, the percentage of women in single or lower houses of national parliament increased from 19 per cent in 2010 to around 23 per cent in 2018. Slow progress indicates the need for stronger political will and more ambitious measures. Women occupy less than one third of senior- and middle-management positions in majority of the 67 countries with data. Forests are among the world’s most productive renewable natural resources, providing sustainable paths to development as a key driver of economic growth while providing livelihoods for hundreds of millions of people, particularly in rural areas. 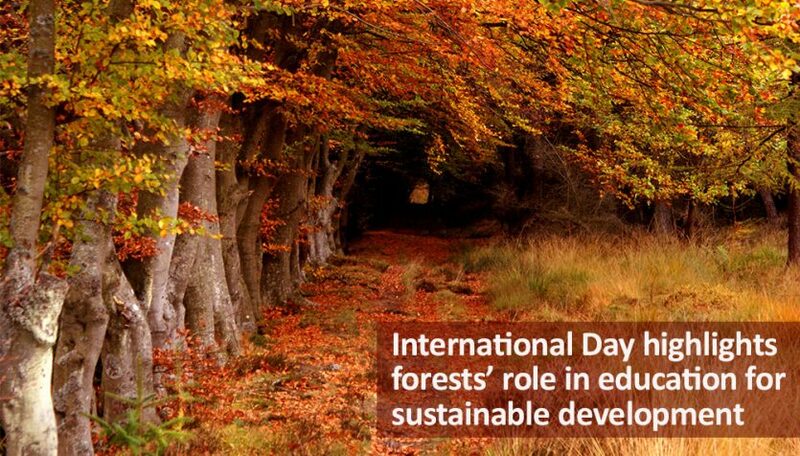 Education is a key enabler for sustainable development, and for the sustainable management of forests. Learning about forests, and their sustainable management is not just good for the environment, it is the foundation for sustainable livelihood and communities. This year, UN DESA’s United Nations Forum on Forests Secretariat will organize a special event in celebration of the International Day of Forests on 21 March at UNHQ in New York, which will highlight how forests and education are essential for creating a sustainable future for all. The event will be held in the ECOSOC Chamber, from 10 am to 1 pm, and will feature remarks by senior UN and government officials, a panel discussion and a general discussion by Member States and UN entities. Follow our efforts for the SDGs in 2019! As 2018 came full circle, we look back at yet another busy year, where pursuing the Sustainable Development Goals (SDGs) has been front and center of our efforts. We’ve gathered young people, civil society, businesses as well as innovators from around the world to share ideas and solutions to help make the global goals a reality on the ground. At the 2018 High-level Political Forum on Sustainable Development, the world honed in on goals 6, 7, 11, 12, 15 and 17 and 46 nations presented their efforts to realize the goals. To tackle the global water crisis and make a difference for the 4.5 billion people who currently lack safely managed sanitation services, a decade for action was launched in connection with World Water Day. Seeking innovative solutions to secure funding for the goals was also high on the agenda, and in addition to the ECOSOC Forum on Financing for Development, the Secretary-General convened the High-level Meeting on Financing the 2030 Agenda for Sustainable Development during the UN High-level week. The latest data on SDGs progress was also released during the year, showcasing where we’re making progress and where we need to step up efforts. The Second UN World Data Forum was also held, bringing together data experts to collaborate on tackling data gaps and challenges, launching new initiatives and identifying mechanisms to increase financing and support for better data for sustainable development. Throughout the year, UN DESA has also kept a close eye on global economy trends, issuing its flagship report the World Economic Situation and Prospects, as well as monthly briefings with continuous updates. The department also took a stand for climate action at COP24. The year concluded with the launch of the first-ever report on persons with disabilities and the SDGs, followed by the adoption of a milestone compact – the Marrakesh Compact – to ensure the safety and dignity for the 258 million international migrants in the world. Continue following our efforts in 2019 via our website, via Twitter and Facebook. 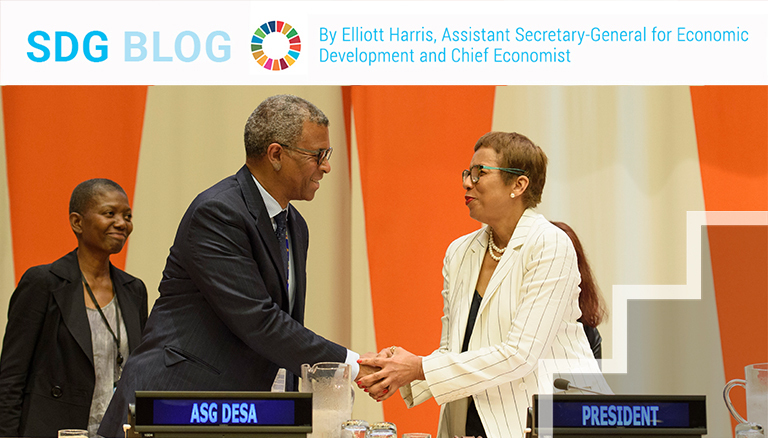 To get a snapshot of our upcoming efforts for the global goals in 2019, check out this highlight article. 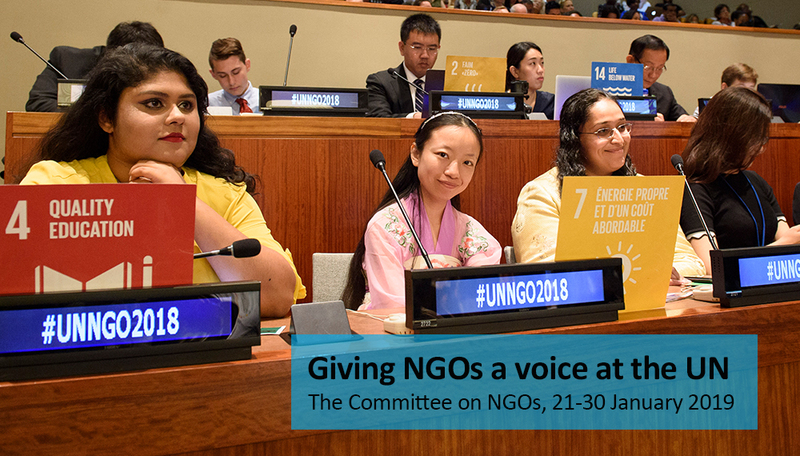 The Committee on Non-Governmental Organizations (NGOs) will hold its 2019 regular session from 21 to 30 January 2019. One of the Committee’s main tasks is to review applications for consultative status by NGOs and to recommend granting status to them. The final decision on the granting of status is taken by the Economic and Social Council, to which the Committee on NGOs reports. Recognizing the crucial role of civil society in elaborating and implementing development policies, the consultative status allows non-governmental organizations to take part in a high number of UN meetings: those of the Economic and Social Council and its subsidiary bodies, such as the Commission on Social Policy and Development, the Commission on the Status of Women or the Population Commission, the High-level Political Forum on Sustainable Development, the Human Rights Council and other UN processes and events opened to civil society. At its coming session, the Committee will consider 288 new applications for consultative status and 233 applications deferred from previous sessions. It will also review the quadrennial reports submitted by NGOs, an obligation for those in status to inform on their activities and contribution to the UN’s work. The Committee meets for eight working days in January and seven additional days in May. Its increased workload over the recent years testifies to the strong interest by civil society actors to engage with the UN in support of the 2030 Agenda for Sustainable Development and other major endeavors of the organization.